Courtney Furner joined LALIVE in 2017. Her main areas of practice are international commercial and investment arbitration and public international law. She also has experience in commercial litigation. Before joining LALIVE, Courtney Furner worked as Associate to the Honourable Justice Robert Mazza of the Supreme Court of Western Australia, Court of Appeal (2015-2016) and in the dispute resolution team of Norton Rose Fulbright in Perth, first as a trainee and then as an Associate (2010-2014). She has also tutored on civil procedure at the University of Western Australia (2015) and interned at the United Nations International Criminal Tribunal for the former Yugoslavia in The Hague (2008). 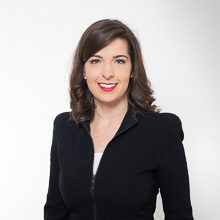 Courtney Furner is a member of numerous professional associations including the International Bar Association, Young ICCA, ArbitralWomen, the European Society of International Law, the International Law Association, the Australian and New Zealand Society of International Law and the German Academic Exchange Service Alumni Association. She has also judged mooting competitions, volunteered as a Humanitarian Observer with the Australian Red Cross’ Immigration Detention Program and acted as Deputy Convenor of the Young Lawyers’ Committee of the Law Society of Western Australia. Courtney Furner was named Junior Woman Lawyer of the Year by Women Lawyers of Western Australia for her contribution to the legal profession in less than five years of legal practice (2015) and Dispute Resolution Scholar by the International Bar Association for an award-winning essay on international dispute resolution (2015). Courtney Furner holds a Bachelor of Laws and a Bachelor of Arts from the University of Western Australia (2012) and an LL.M. in International Dispute Settlement (MIDS) from Geneva Law School and the Graduate Institute of International and Development Studies (MIDS-Young ICCA Scholar and Valedictorian, 2016-2017). She has also undertaken legal studies at the University of Vienna (2007-2008), the European Academy of Otzenhausen (2009), Ludwig-Maximilian University Munich (2013), the University of Salzburg (2013) and The Hague Academy of International Law (2014). During her time at the University of Vienna, she represented Austria at the Telders International Law Moot Court Competition in The Hague at which she was awarded the prizes for Best Oralist and Best Written Memorial (Respondent).